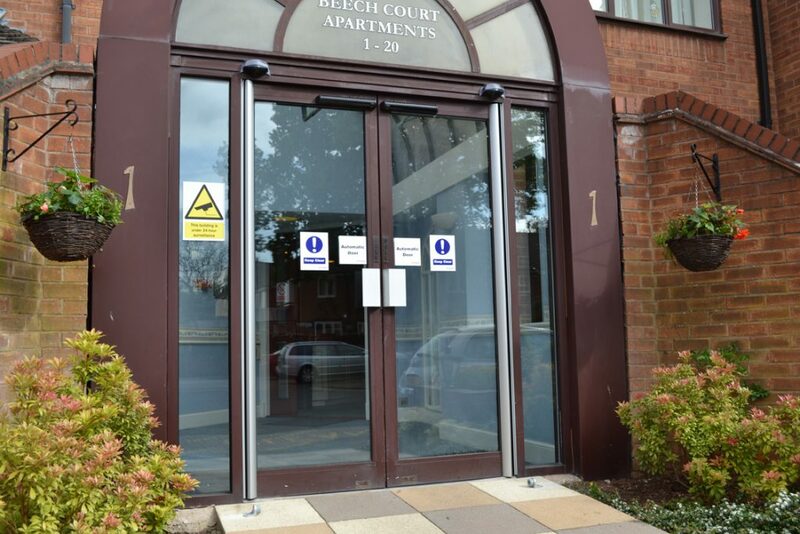 With thirty two apartments and several cottages and bungalows in its complex, when pedestrian access became a serious problem at Beech Court Retirement Home in Solihull, Warwickshire, the residents and their facilities committee called in access control experts Tate Solutions to resolve the unreliable and hazardous condition of their main entrance doors. Once the Tate engineers had carried out a detailed risk and hazard assessment of the doors, the levels of pedestrian traffic and the environment around the entrance area, the recommendation by the experts at Tate was to supply and install automatic doors that fully complied with BS7036 and BSEN16005. The final specification included Tate EMD operators, because of their ability to be programmed for any situation, their durability and longevity. Activation was via motion radars fitted with external weather shrouds. Both doors were fitted with on-door safety devices to stop the doors closing and opening on users who may be in the way of the opening/closing cycle of the doors. As the doors were centre hung and the gap between the frame and doors was approximately 50mm, which would cause a problem with finger/hand entrapment. Safety and injury prevention is paramount, therefore in order to assist with compliance to BS7036 and BSEN16005 a pivot safe anti-finger trap system was used, which ensures continual safe and virtually maintenance-free operation. A key switch at a safe working high of 1500mm was fitted to enable the Facilities Team to turn the units on/off or put the automatic units into the hold open position, thus allowing the residents to move large bulky equipment or furniture through the doors safely. The whole installation, including the removal of the doors, commissioning and training the staff was completed in one day causing a minimum amount of disturbance to staff and residence. Since the installation was completed the positive feedback both from the retirement home management and its residents is one of complete satisfaction, with one resident stated “It’s the first time in 3 years that I have been able to use the main entrance doors without assistance, from either carers or staff. 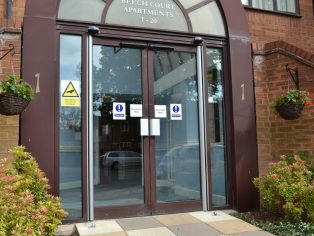 “Our nationwide team of door specialists are regularly called in to replace worn out or dangerous installations such as Beech Court. At Tate we have built a solid reputation for delivering the complete access control solution, whatever the circumstances we pride ourselves for always providing the highest standard of products and service.